Pub Fruity is a popular online slot machine game developed by Microgaming software, and it is based on the theme of having to play in a local club with a fruit machine slot. The game possesses a single payline, and is more challenging than many games, which come with higher paylines. The game also contains symbols related to fruits and having various points according to their valuations. The game can be played for real money in various casinos, which supports Microgaming software games. No downloads are required and is available widely across the countries of UK and USA. A person can play free Pub Fruity casino slot machine game and win non-monetary prizes. The game comes up with a coin size from the range of 0.10 to 10. The allowed coin per line in the game is 1. With 3 reels and a single payout line, this allows the players only one way to win. However, with the likes of medium level volatility and medium variance, the game is a pretty safe option for those players who prefer to play for fun and wont risk out with monetary means. The game consists of 8 fruit symbols, which includes BARs, Bells, Cherry, Grape, Lemon, Orange, Pub Fruity and Watermelon. The Pub Fruity logo contains the highest valuation and stands with the highest pay of around 250X of the total betting and on hitting three of the same symbols on the winning payout line. On hitting three bell symbols, the second highest pay of 50X can be won. Other symbols have a range of pay multipliers, ranging from X25 to X2. The numeric characters appearing together in the reels with the regular icons help to increase the chance and move up in a feature called as Drinks Trail. Drink Trail: This is a feature, which is formed and is applicable in the base game itself. The feature is activated with the combination of numbers combination with regular icons. In the feature, some of the symbols in the reels contain numbers of the total distance of traversing along the trail. The more places the trail commences, the chances of winning potentially bigger jackpots increases in heap. Alongside in the feature, there are multipliers, which can be only held applicable if the total spins ensure a win. Darts Game Feature: Pub Fruity contains one more bonus features in the form of Darts. In this feature, a dart will be accompanying any symbol on the reels and on doing so; one of the dark shaded symbols in the reels will start to glow. If the player ensures to light up all the three spaces in the reels, rest assured this will activate the dart game without any sorts of delay. The players are required to pick one of the three characters, which will be shown and then will be required to throw three consecutive darts each. With the darts result being very simple, that higher the ranks, more will be the multiplier ready to multiply the total wager and ensure a win and secure the maximum prize of 1000X. Nudges are considered to be one more special feature of the game, and these can be won on moving the Drinks Trail to 8 places. On doing so, the players will benefit in traversing individual reels and can make a winning combinations for sure. Pick to Win: The win type feature allows free spins on the particular reel. The players are required to contain the moving reels by forming winning formations on the payline as the reels keeps on moving. Pub Fruity online is one of the standout games of Microgaming software. 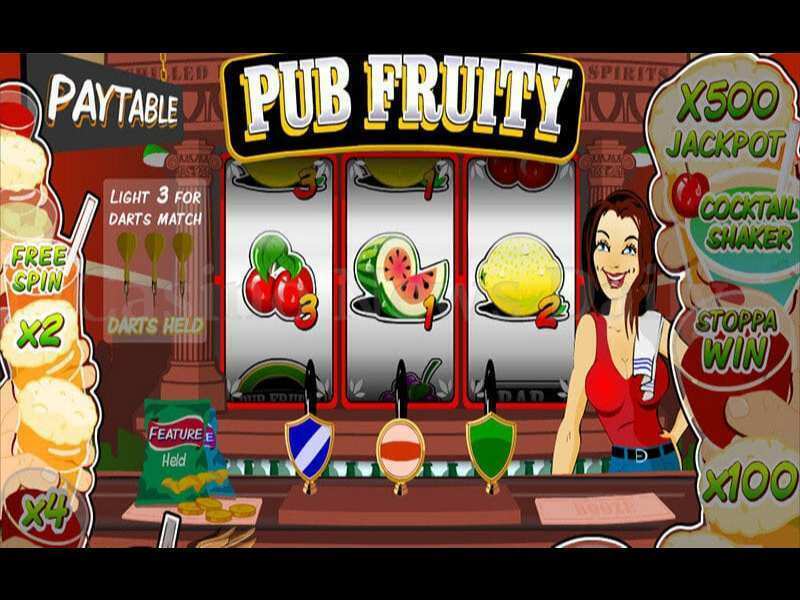 The theme of the game is all about fruits and gives the players an awesome environment of having to play fruit machine slot game in a local pub. Right from the fruit theme and a gripping background music adding merits to the game, Pub Fruity is a wonderful game, which adds to the players’ choice of having to play the game. The game consists of free spin features, backed with distinct features such as drink trails and dart game, which comes to play an important role in providing jackpot rewards to the players on matching certain set of symbols and cards. 0 responses to "Pub Fruity Slot"